Now that Facebook has tweaked EdgeRank, the common refrain is that brands are being forced — blackmailed even — to pay to reach their Fans. My response: Well, yeah. Sorta. And my follow-up: That makes Facebook a better place. 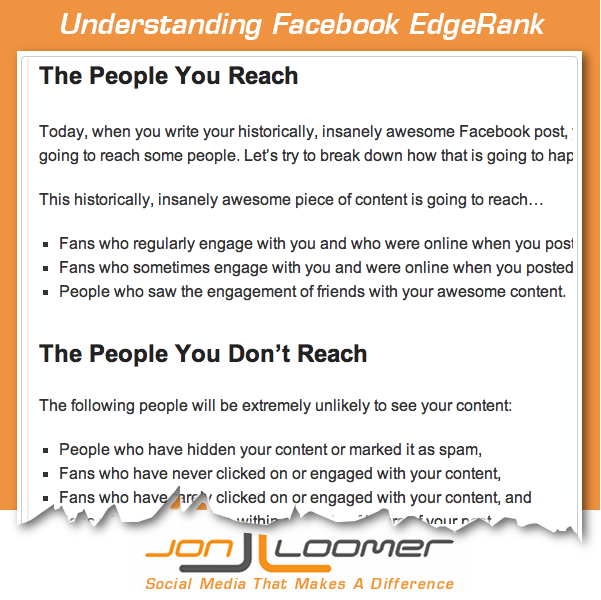 Today, when you write your historically, insanely awesome Facebook post, you’re going to reach some people. Let’s try to break down how that is going to happen. People who saw the engagement of friends with your awesome content. Fans who weren’t online within a couple of hours of your post. This is if your content is historically, insanely awesome. If it’s average — meaning that it doesn’t get a ton of clicks, comments, likes or shares — expect to reach fewer people. How often others are engaging with that content. Is that unfair? Not really. It’s Facebook surfacing your content to the people most likely to want to see it. Think that’s BS? Not according to the results I’ve seen — both on my Page and globally. Reach does seem to be down a bit, but engagement remains steady. That can only be the case if Facebook has made the News Feed more relevant and efficient. Let’s use an elementary example. Before, I reached 100 people to get 20 forms of engagement. Now I’m reaching 90 people to get the same 20 forms of engagement. Should I feel wronged for not reaching the 10 invisible people? There’s something that needs to be said here that brands do not want to admit: Some of your Fans simply do not care if they hear from you. Even stronger, some don’t want to hear from you at all. Don’t assume that the “Like” is an implied subscription to see all of your content. People “Like” for different reasons. Sometimes they want to see your stuff. Sometimes it’s just as an expression. But don’t think it’s not perfectly clear how they feel about you. If they wanted to see your content, they would be engaging with it. And when Facebook sees they don’t care about your content, Facebook stops showing it to them. Maybe they don’t want to hear from you in general. Maybe the tepid response to your post is a cue to Facebook that most won’t want to hear from you. But it’s something you need to understand and accept. So, you need to pay a few bucks to reach those people? Gotta shell out some green to invade the News Feeds of people even though your content was crap? Forced to pony up to get in front of someone who hasn’t once engaged with your content? It actually makes sense to me. And I think it makes Facebook a better place. If you aren’t reaching the number of people you think you should reach — if the engagement is also low — you have two choices: 1) Learn and adjust, or 2) Pay to reach those less willing to be reached. You could yell and scream that Facebook is screwing you. But I don’t think that will get you very far. Personally, I wouldn’t pay to promote a post that isn’t getting engagement. That’s your sign that it’s a waste of money. I often have people tell me that a Facebook ad “failed” because they spent $100 and didn’t get much of anything in terms of engagement or conversions. But they’re missing the point. You paid to reach more people. Those people may not have wanted to be reached. You can’t pay to force them to engage. If they don’t engage, it’s a sign that your content was a failure. Not your ad. So, is it blackmail to force you to reach people who weren’t online, don’t engage with your content or likely wouldn’t be interested based on initial response? No way. It’s understanding what users want. It’s controlling the flow of stuff they don’t want. And it’s profiting if you want to override that control.